Carla Sonheim is an artist and creativity workshop instructor known for her fun and innovative projects and techniques designed to help adult students recover a more spontaneous, playful approach to creating. Her innovative ideas are now collected and elaborated on in this unique volume. Carla offers a year's worth of assignments, projects, ideas, and techniques that will introduce more creativity and nonsense into your art and life. Drawing Lab for Mixed-Media Artists offers readers a fun way to learn and gain expertise in drawing through experimentation and play. There is no right or wrong result, yet, the readers gain new skills and confidence, allowing them to take their work to a new level. 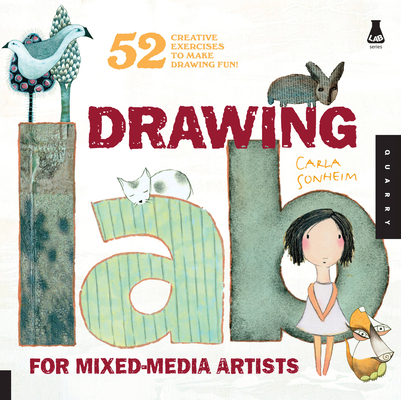 If I ever meet Carla Sonheim, I will probably not be able to suppress the urge to hug her for writing “Drawing Lab For Mixed Media Artists: 52 Creative Exercises to Make Drawing Fun”. Loaded with a year’s worth of inspirational prompts, this book is for all of us creative types who stopped drawing right around the third grade because we decided we weren’t talented enough to stick with it. From doodle sketches to paper dolls, this book will renew your confidence and make you want a new sketch book and box of Crayolas.